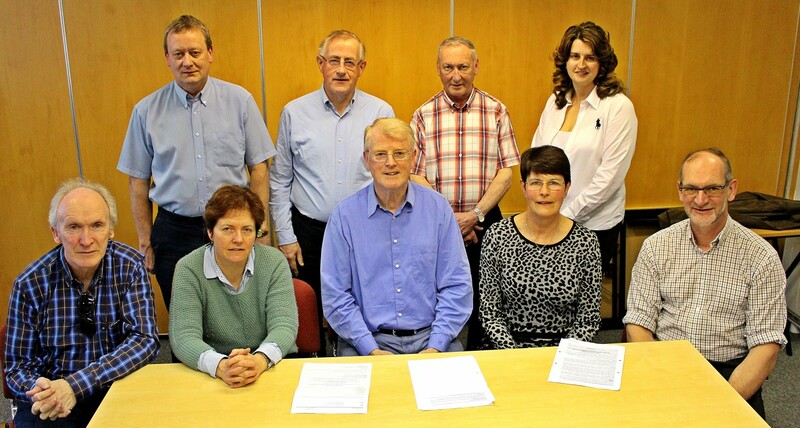 Bailieborough Development Association Board members looking to the future with confidence. Back Row – Leslie McKeague, BDA Board Member; Jim Maguire, BDA Board member; Hubert Jennings, BDA Board member and Shirley Hall, BDA Board member. Micheal McDonald, Treasurer Bailieborough BDA; Mary Sheanon, BDA Board member; Peadar Reynolds, BDA Chairman; Isobel Davidson, BDA Board member; Padraig McBreen, BDA Secretary. Missing from picture is BDA Board Members Aidan Clarke, Robert Smyth and Patrick McEnaney. The future development of the Town of Bailieborough and environs is in good hands under the direction of the dynamic and futuristic Bailieborough Development Association. To get a perspective on what they Association has achieved on many fronts since it got off the ground in 1996, the Anglo-Celt spoke to the Chairman of the Board, Peadar Reynolds. For instance did you know that the BDA has an Enterprise Centre located at Stonewall and the units are leased to small and medium businesses with a total of fifteen employed. The Association also have their modern Business Centre adjacent to the Shercock road, where there are 24 people employed in Technology type businesses. They also provide an affordable after school childcare facility and have been involved in various community enhancement projects. 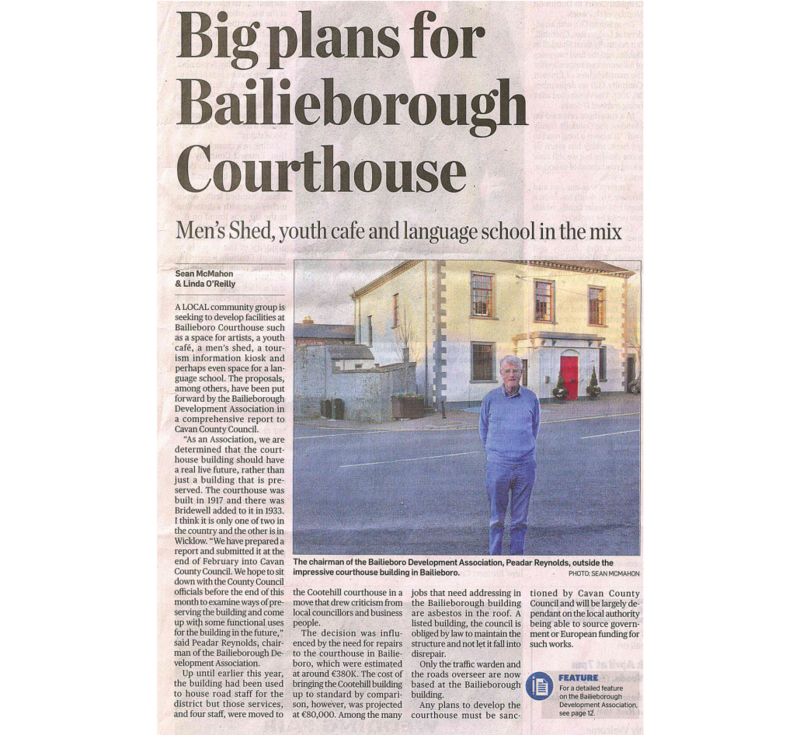 The Chairman of the Bailieborough Development Association, Peadar Reynolds said that the Courthouse is a landmark building in the town. “As an Association we are determined that the Courthouse building should have a real live future, rather than just a building that is preserved. The Courthouse was built in 1917 and there was Bridwwell added to it in 1933. I think it is only one of two in the country and the other is in Wicklow”. “We have prepared a report and submitted it at the end of February into Cavan County Council. We hope to sit down with the County Council Officials before the end of this month, to examine ways of preserving the building and come up with some functional uses for the building in the future”, said Peadar Reynolds. Peadar Reynolds said one of the idea being examined transform an area into a workspace for artists and also develop a Youth Café in the building. “We have 400 foreign students coming into Bailieborough every year to learn English and the people who run that course would be interested in getting a location that would afford them an opportunity to develop and expand on that work”, said Peadar Reynolds. He added that they are also looking at the idea of a Men’s Shed for senior citizens and the possibility of a Tourist Information Kiosk. “We see the Courthouse as a focal point not alone for Bailieborough but in terms of the development of heritage and tourism facilities for the whole area. We have great natural advantages for outdoor activities – we are looking at linking the facilities at the Castle to the Lough An Leagh area, to facilitate such things as mountain biking”, said Peadar Reynolds. 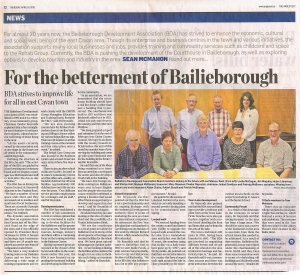 The Bailieborough Development Association have established a number of sub-committee’s to look at various options that they are interested in exploring in the future with reference to the potential development of Bailieborough and the greater East Cavan area. Some of the areas that will be explored will include tourism, heritage, industry and a there will be a continuing focus on the training activities in the Business Centre. Peadar Reynolds pointed out that the BDA has a very good relationship and an ongoing dialogue with the IDA. “A new initiative called the Five Year Jobs plan was launched recently”. An action plan for jobs for Regional Enterprise Consultation took place on last Monday in the Nuremore Hotel, Carrickmacross with the Minister for Jobs, Enterprise and Innovation, Richard Bruton in attendance. Members of the BDA were also in attendance. 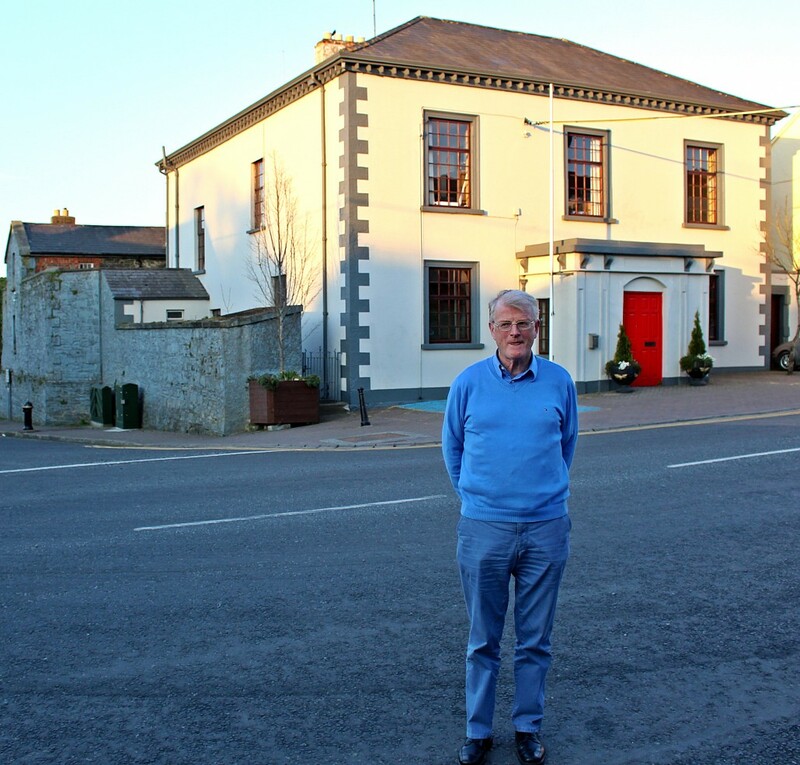 The Chairman of the Bailieborough Development Association, Peadar Reynolds said the Association got off the ground in 1996 and it is a voluntary cross community group. He explained that is has a straightforward objective to enhance the economic, cultural and social well being of the Bailieborough area. “All the assets currently owned by the Association and at any stage in the future are all vested in the community”, said Peadar Reynolds. They have an Enterprise Centre located at Stonewall adjacent to the Virginia Road. “We have a number of workspace units there and they are leased out to medium and small sized local Businesses. There are currently 15 people employed in the those Businesses”. The dynamic Association also have an expansive Business Centre just off the Shercock Road on the edge of the town and it was officially opened by President Mary McAleese in 2008. It houses Technology Type Businesses and there are 24 people employed across the spectrum of Businesses located there. The manager is Lee McDonald. The Rehab Care Group are also located in the Centre and around thirty Service Users frequent it five days a week. Peadar Reynolds says there is also an after school childcare facility located in St Anne’s Community Centre and that offers safe, quality, affordable childcare for forty local families. Approximately 300 children have used the service over the years. “Our Child Care service provides employment for a Manager and six staff”. “We have a very modern training suite in our Business Centre and we have been delivering a wide range of training programmes and we work closely with the CMETB”, said Peadar Reynolds. “We are also running courses here for farmers to introduce them to online banking and filling in forms for various things like ear tags. There are 26 farmers in at that training course at the moment and that takes place once a week”, said Peadar Reynolds. “We sourced funding from the County Council and liaised with Coillte to upgrade the Looped Walk around the Castle lake. It is a tremendous asset and in fact over the last ten years, the numbers using that facility on a daily basis have gone up by 300 per cent”, said Peadar Reynolds. He pointed out that there are very few lakes in the country which has a looked walk right around the lake in close proximity to the shoreline. Peadar Reynolds also pointed out that they sourced funding to provide a walkway and plant trees at the Town Lake. Picnic benches were also put in place together with a notice board detailing the flora and fauna that can be found in the area of the lake. Of course Bailieborough was 400 years old in 2010 after being founded in 1610. “The BDA got involved in organizing different events and we got all of the schools in the area involved in heritage and historical projects”. Peadar Reynolds said it was a tremendous success and there was great interaction between the various local schools on the projects, including St Anne’s and the Model School. Peadar Reynolds said that as a result of the downturn in the economy, there was a huge issue with unemployment in the area. “So we decided to carry out a survey of the Businesses in the area to ascertain from them the critical issues that needed to be addressed. 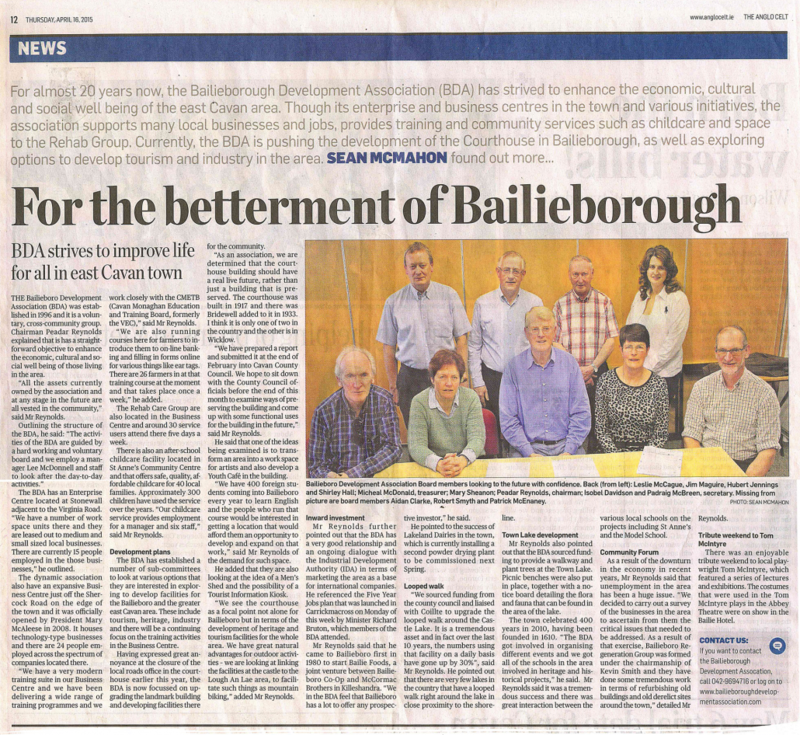 As a result of that exercise, Bailieborough re-generation group was formed under the Chairmanship of Kevin Smith and they have done some tremendous work in terms of refurbishing old buildings and old derelict sites around the town”. There was an enjoyable tribute weekend to local playwright Tom McIntyre which featured a series of lectures and exhibitions. They had all the costumes that were used in the Tom McIntyre plays in the Abbey Theatre on show in the Bailie Hotel. “The activities of the BDA are guided by a hard working and voluntary Board and we employ a Manager, Lee McDonnell and staff to look after the day to day activities”, said Peadar Reynolds.